Great turnout. Good luck all. Wow... is anyone else finding it REALLY hard to choose just 6? This is getting me excited. I'm going to take my time with voting. I looked through everything over the past couple of days and I'm stuck. The choices are insane. Wow, some awesome choices here. it's going to be crazy hard deciding. Am I missing an important link or something? Wow the Ryloth regional is stacked with some of the best someone from that pool is going to screwed while having one of the best pool. The one's I feel should be in the top ten are all in that pool. I guess that's what a random number generator will do to you sometimes. This was a great turn out though so many quality entries very hard to choose. Almost felt like christmas watching all the great entries coming in over the past week. Really amazing turnout both in quantity and quality. Probably a stupid question, but does anybody know how 3rd place is determined in a bracket system? 3rd highest vote count from the top 4? from the final four, the top two winners vie for 1st and 2nd. the losers vie for 3rd. Good luck to everyone, this builds are out of this world would not like to be in the judges seats for this one! What a great turn out!! Wow, that was hard! Too many great entries. I wasn't around for last year's contest, but I've browsed through that thread. Is it just me, or has the level of competition really gone up this year? It wasn't as hard to choose as I thought, although it still took some time. So many awesome entries! Voting for round 1 done. This will get uglier than the GOP race! Um, it only let me vote for 4, not 6. Whats up? 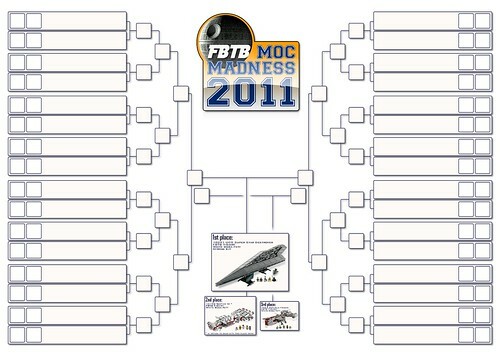 For this first round, I have simply voted for the "best looking Star Wars ships" but for the next round, I will purposely not vote for ships that use a box or a tank as a prison. This is definitively not Star Wars (and no, Han Solo in the carbon freezing solution was more an axception than the rule). In SW, you see or get references of a lot of detention cells, both on large structures (Death Star, palaces like Jabba's, Imperial prisons...) or ships (ISD, Slave I...). I sadly consider the use of tanks for prison as a workaround or a bypass to the rule. But this is my humble personal opinion and I still wish the very best to each participant. Veynom wrote: For this first round, I have simply voted for the "best looking Star Wars ships" but for the next round, I will purposely not vote for ships that use a box or a tank as a prison. This is definitively not Star Wars (and no, Han Solo in the carbon freezing solution was more an axception than the rule). In SW, you see or get references of a lot of detention cells, both on large structures (Death Star, palaces like Jabba's, Imperial prisons...) or ships (ISD, Slave I...). I sadly consider the use of tanks for prison as a workaround or a bypass to the rule. It also depends on how narrow your personal Star Wars universe is, since kolto tanks were definitely used for prisoner containment in Knights of the Old Republic. They also used cylindrical force fields as prisoner detainment cells too. In the context of this contest, I do agree with tank usage influencing voting... but based on if it was implemented well versus just a "lazy solution"... (I actually have more of an issue with cramped cubby holes for containment). Besides, it makes only minor appearances in SW materials (mainly KOTOR). And FYI, there are more obvious examples of bounty hunters with lightsaber, Aura Sin to start with. Last edited by Veynom on Thu Nov 03, 2011 8:47 am, edited 1 time in total.